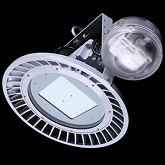 Forty high power LEDs, Die-Cast Metal with integrated trim, no UV, instant on/off, longer life than compact fluorescents, maximized efficiency for voltage, constant current design, solid state, high shock & vibration resistant, mercury-free, 50%+ savings in energy consumption, no noise, no flickering. 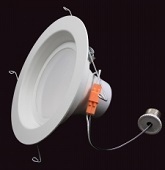 This lamp is Energy Star listed and built in accordance with Intertek (ETL) and UL testing standards. Click the button below to add the 6'' 19 WATT DIMMABLE DOWN LIGHT E26 BASE (SHOWN) OR GU24 BASE to your wish list.